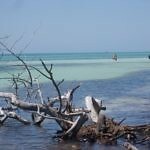 Located on on the overseas highway right in the heart of the Florida Keys, Bahia Honda is the perfect place to relax and enjoy the true beauty the keys has to offer. 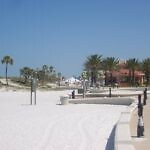 The park is surrounded by award winning beaches both on the bay and ocean side which offer the perfect place to take a swim or just simply relax on the soft sands enjoying the year round sunshine. Blessed with a gentle offshore breeze the park offers the perfect venue to soak up the sun without over heating although please do bare in mind that the sun in the keys is extremely strong year round, it would be irresponsible of us not to recommend a good sun screen is used at all times. Pick a shady spot in the car park and you car will remain cool for your return. 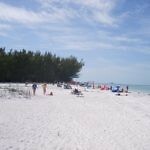 The entrance to the park is located at mile maker 37 on the left side of the highway if travelling towards Key West. Shortly after entering the tree lined entrance you will be greeted by a very friendly and informative park attendant that will take your entrance fee and point you in the right direction to the most suitable parking. Most of the parking is very close to the main beaches and marina as well as the main concession and amenities. Located centrally to the park, next to the marina and only a minutes walk to the main beach is the main concession building which is home to rentals, gift shop, cafe, boat trips and restrooms. The cafe offers a delicious range of cooked meals, snacks, subs, ice cold drinks and ice creams as well as daily specials all at very reasonable prices. We recommend if available on the specials board you try the pulled pork sub, perfect for taking down to the beach for lunch. Snorkeling trips to Looe Key marine sanctuary are a must. If your looking for slightly more than sunning yourself from your visit then the rental office offers sit on top kayaks by the hour at very reasonable prices. The calm, clear waters around the key offer the perfect environment for a gentle paddle which is suitable for all abilities and if its your first time, help and guidance is on offer to get you on the water. Whilst out paddling don’t forget to look over the side for the chance to see an abundance of sea life, you wont be disappointed. The rental store also offers Snorkeling equipment and boat trips and we’ve always found all the equipment in excellent condition and well maintained. Aside from the beaches and water activities the park also has miles of trails suitable for both walking and cycling, and from the trails you will find secluded beaches, mangroves and an abundance of wildlife and beautiful plants, don’t forget to keep your eyes peeled for nesting Iguanas dotted around the island. 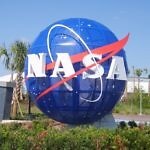 Unfortunately the chance to walk on a section of the original overseas highway is closed temporarily although it is still possible to walk the trail to see it close up. Forget any worry about getting lost either as trail maps are located around the park to help you find your way at your own pace. Bahia Honda also offers a small selection of rental cabins and some 80 camping pitches. Spending a few evenings away from the rest of the world under a starlit sky is a perfect way to enjoy the keys and with low levels of light pollution is a stargazers dream. 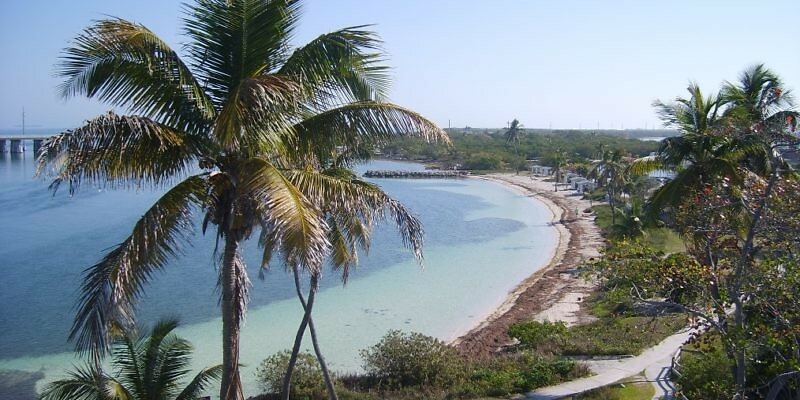 We thoroughly recommend Bahia Honda state park not be missed if your visiting the keys and if you looking for a beach day there is no better more enjoyable place to find it than here. Park open from 8:30am till sunset daily. Entrance is currently $8 for a car and 2-8 occupants. $4 single occupancy car entry. On foot/cyclist entry fee $2. 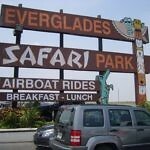 Boat slip rentals from $10. Cabin hire from $120 per night. Camp pitches from $36 per night. Toilets and facilities on site. Cabin, Camping and other bookings. Concessions, boat services and rentals. 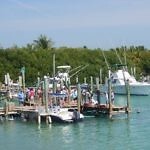 One of the Florida Keys most popular attractions, Robbies Marina is a must stop off on your journey on, off or along the keys. Located in Islamorada Robbie’s is home to the long time world famous opportunity to hand feed Tarpon. Yes hand feed these giant fish weighing over 80lbs if your brave enough. When you arrive you will have the chance to buy a small bucket of food for a few dollars and then proceed to the jetty’s were should you have the courage, lay down with bait in hand and the Tarpon will leap out of the water and take the food straight from your hand. Be warned though, Tarpon have a huge mouth and will happily, if only momentarily, grab your hand also. They soon let go though as they much don’t care for hands as their lunch. Another word of caution, guard that food with your life. The birds although harmless and not to bothersome will do their very best to get fed before the Tarpon do. Robbies is not just about feeding the Tarpon though. There is a vast array of things on offer to keep you amused for hours and countless return journeys. After feeding the Tarpon, Grab and Ice cold Beer and relax overlooking the Marina. There is a small market where vendors sell craft and food items many of which are hand made from materials and skills unique to the keys. Looking for lunch, well there is an onsite informal restaurant where you can grab a ice cold beer and over look the marina. If you want a little more adventure and get the adrenaline flowing then Robbie’s can offer this also. Kayaks, Snorkeling, Boat rentals and tours are just some of activities on offer whilst your visiting. So how do you get there. 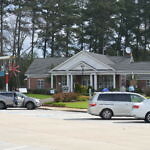 Well Robbies Marina is located at mile marker 77.5 on the bay side of the highway. The marina itself is actually located on Lower Matecumbe Key and if driving onto the keys from the north is located on the right as soon as you come off the bridge from Islamorada. 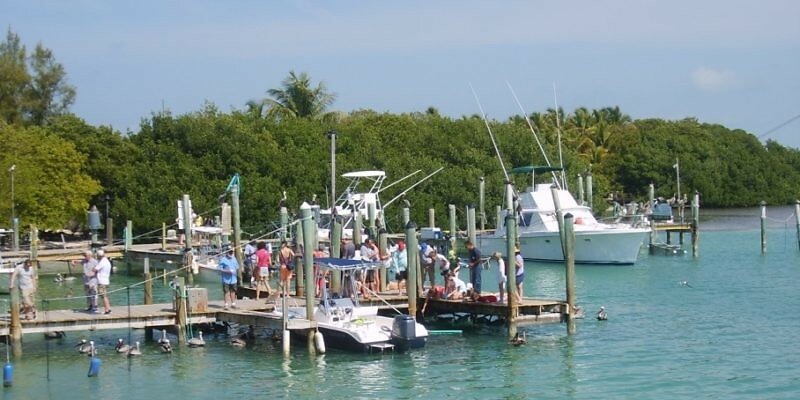 Robbies Marina is approximately 1hr 45 mins from both Miami and Key West. Open from 8am – 8pm year round. Kayaks and boats available for rental. Visit the Robbies site for more details and booking details. Please mention you heard about Robbies with us when you contact them. Key West is famous for being the origin of the Key Lime Pie and Conch Fritters but did you know it offers so much more than that. 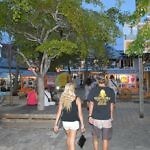 Eating out is a big deal in Key West both before and after sunset and there is something available to suit all taste Buds. Being close to the Caribbean and having somewhat of a close association historically with its closest neighbors like Cuba this is heavily reflected in its food culture also. If fact most food regarded as being local and native to Key West is of Cuban descendancy. As much as the Conch Fritters may be high on your list of must try delicacies be sure to add an authentic Cuban Sandwich to your list. The Old Town in Key West is littered with small kitchen sellers and restaurants selling authentic Cuban dishes, Sandwiches and drinks and you will never be short of somewhere to grab a snack. Prices are reasonable and $10 will often get you a good lunch time fill and a refreshing drink. Duval Street, the main tourist hub in Key west is lined with restaurants, bars and cafes and is probably the first stop for most looking for food. 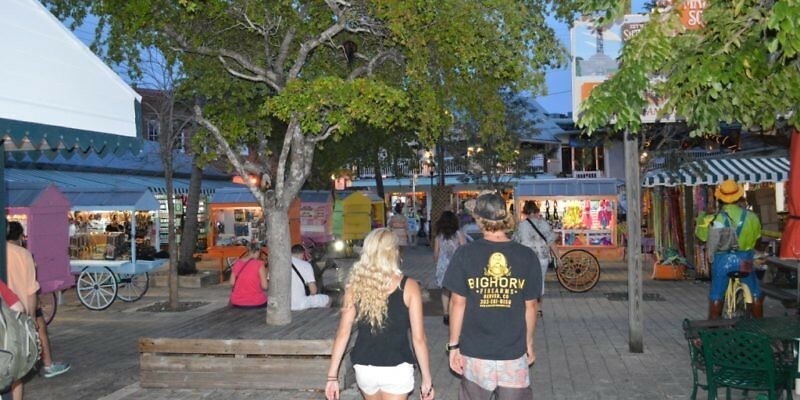 Although Duval St is the location for the big name and well know bars and restaurants like the Gas Monkey Bar and Grill, Senor Frogs Key West, Sloppy Joe`s and Hard Rock Cafe, you will often find something a little more locally sourced at some of the other restaurants on offer. Amigos Tortilla Bar – Greene and Duval st. Great quality fresh Mexican and Cuban food with dinning both inside and out. Bagatelle – Duval St – Offers local food with outside eating terrace located in an original Key West town house. Juan Loves Lucy – Duval St. Authentic Cuban food served up and cooked by Cubans. Highly rated service in a small off street relaxed and casual location. Also serves top quality Mojitos. Caroline`s Cafe – Duval St. A small family run cafe serving up American dishes made with fresh local produce. Perfect for families and light lunch’s. Key West Key Lime Pie Co – Greene St and Ann St. Serving up some of Key Wests finest and original Key lime pie. They are not small portions either. Conch Republic Seafood Company – A&B Marina Greene St. Top quality seafood- lively atmosphere with a large menu the restaurant is packed almost every hour its open. Location and seating overlooking the Marina is second to none. A&B Lobster House – A&B Marina Front St. Great restaurant for fresh local and American seafood dishes. 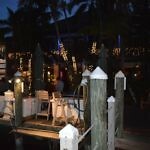 Located in the picture perfect marina location for a special evening dinner. El Meson de Pepe – Mallory Square, Wall St. Great tasting full table service Cuban restaurant with a lively feel with often live music and welcoming staff. Kermits Kitchen Key West Key Lime Pie Shoppe – Duval St. Shop and cafe selling everything and anything that could possible be Key Lime flavored including the traditional pie. Bit of a tourist trap for souvenirs but popularity is deserved. Blackfin Bistro – Duval St. Might not look to great from the street but do not let this put you off. This place serves up some of the most highly rated dishes in Key West with friendly service. The Salty Angler – Duval St. Simple, well though out menu serving up some interesting but fantastic food combinations as well as traditional dishes. No one in the family will be disappointed here. Southernmost Beach Bar – Southernmost Beach. Beach front cafe serving up a decent range of local and international snacks and light meals. Good range of drinks available. So there we have a selection of Key Wests favorite eating places but of course there is so so much more on offer around every corner and if your just looking for a quick bite or something more familiar then outside of the main old town you will find the usual Domino’s Pizza, Wendy’s, Denny’s, Outback Steakhouse, Miami Subs and Baskin Robbins Etc. 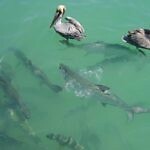 Feed the Tarpon at Robbies Marina.